Not many people could make Winston Churchill cry, but King Edward VIII managed to do it. The reason for Winston's distress was Edward's abdication. 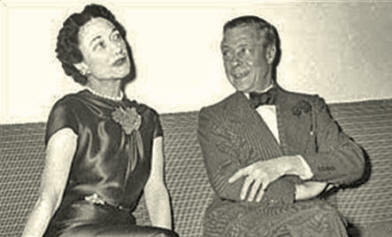 The reason for Edward's abdication was Edward's love to double divorcee Wallis Warfield Simpson. Dames. Edward's full name was Edward Albert Christian George Andrew Patrick David, which his mother, Queen Mary Of Teck, only called him when she was not happy with her boy. And that was very much the case on December 10, 1936, when Edward officially and irrevocably renounced the throne for himself and his descendants. For the British, that was a first. Edward VIII was king of the United Kingdom of Great Britain and Ireland and of the British dominions as well as emperor of India from January 20, 1936, until December 10, 1936. On December 10, 1936, Prime Minister Baldwin announced the news to the Commons. On December 11, 1936, and via BBC radio broadcast, Edward VIII gave his abdication speech. After his abdication, Edward was Prince Edward, the Duke of Windsor. On June 3, 1937, Edward and Wallis Simpson married in France. Edward's younger brother Prince Albert, duke of York, became King George VI, who in turn became father of Queen Elizabeth II. See also the chart Governments in History.